God of the Bible, God of the Qur'an-are they the same God? God of the Bible, God of the Qur’an-are they the same God? The solution to this stalemate is that the question that should be asked is not about sameness, but about difference. What is the belief that Christianity has that Islam does not adhere to? From this difference stems all other differences. There is an unavoidable difference in the conception of God as spoken of by Christianity and Islam. This difference is in one word: the gospel. 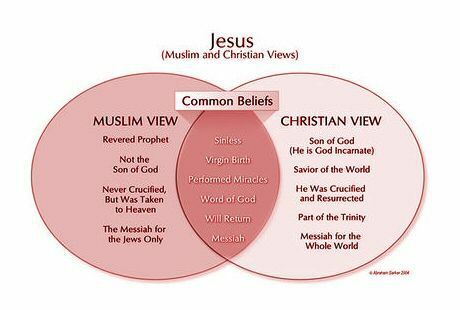 Both have common beliefs, but Christianity goes much further than Islam does, holding to core beliefs about God not found in Islam and even strongly rejected by it. But the answer to the question “Is the Father of Jesus the God of Muhammad?” is also no, for Muslim theology rejects the fatherhood of God, the deity of Jesus Christ, and the personhood of the Holy Spirit—each of which is an essential component of the Christian understanding of God. No devout Muslim can call the God of Muhammad “father,” for this, in Islamic thought, would compromise divine transcendence. But no faithful Christian refuse to confess with joy and confidence, “I believe in God the Father, Almighty!” Apart from the revelation of the Trinity and the Incarnation, it is possible to know that God is, but not who God is. In his paper, Allah and the Trinity, Dr. Imad Shehadeh explains how Islam’s changing of concepts, predicates and attributes pertaining to the God of both the Old and New Testament, results in the “speaking of a different subject all together. The starting for both Christianity and Islam is belief in both the existence of God and the oneness of God. However, Christianity and Islam proceeded in two different directions. This resulted in a vast difference of opinion in regard to the question of whether they believe in the same God or not. To put it another way, is the starting point the same? Both Christianity and Islam believe in the existence and oneness of God, but this belief is so fundamental and rudimentary that even the fallen angels believe the same. The Bible challenges the person that has this faith saying, “You believe that God is one. You do well; the demons also believe, and shudder” (James 2:19). Islam later presented a different concept of the same word “Allah” used beforehand by Jews and Christians. The result was that there ends up being a similar subject with different predicates, or attributes. This different concept made it impossible for Islam to move in the same direction that Christianity was moving on, with its foundation in the Old Testament of the Bible, and continuing into the New Testament. “Whoever knows the Old and New Testaments, and then reads the Qur’an, clearly sees the process by which it completely reduces Divine Revelation. It is impossible not to note the movement away from what God said about Himself. First in the Old Testament through the prophets, and then finally in the New Testament through His Son. In Islam all the richness of God’s self-revelation, which constitutes the heritage of the Old and New Testaments, has definitely been set aside.